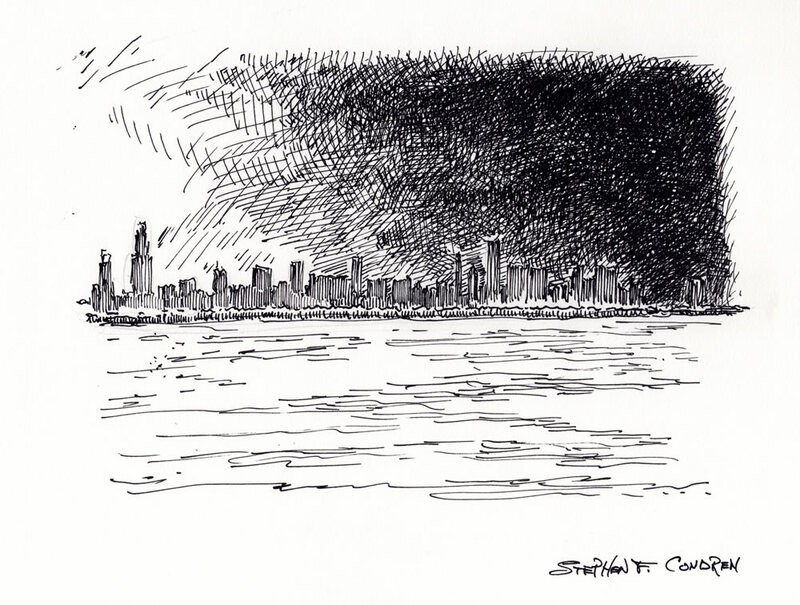 This article is about pen & ink cityscape drawing of the Chicago skyline #749B, which is a cityscape stylus sketch, is for sale at discount with prints by artist Stephen F. Condren, BFA-SAIC, of Condren Galleries, a Fine Arts Gallery, offering JPEG & PDF scans. This Chicago skyline #479Z drawing is done at sunset. The setting sun is on the left side of the drawing is from the east (behind Willis Tower) where it holds command. From this point the power of the sun’s rays are cast to the skyline and out onto Lake Michigan. Making the pen & ink work effectively in creating spectrum in a work of art is difficult. For it takes great skill and care to use just enough line work to convey the gradual transition of tones. It is ever so common to cast stroke of in in random formations leaving poor results. Every single stroke has to be calculated. As I draw the lines with my pen I eye every element on the paper and keep moving my pen tip on a path that correctly satisfies the needed tone. It is with difficulty that I explain this process but it exactly what I do. As I move the pen and process strokes at the same time I look at the space and move the pen to fill in the need tone. Also, as I move the pen I am very aware of the length of each stroke. If the space permits I make the strokes later and if not, then smaller. This is a quandary for I only know how to make the strokes as I move the pen. I cannot calculate the movements of the pen before hand.